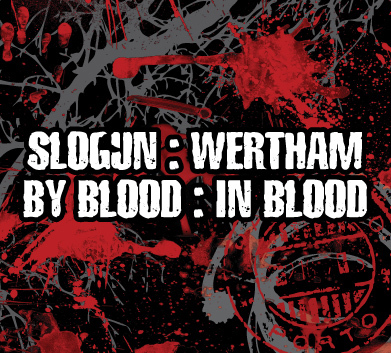 Collaboration CD between NYC true crime legend SLOGUN and Italo-anti-socialite Wertham. 10 tracks featuring collaborations and stand-alone tracks by both projects, focusing on different atmospheres, ranging from full-blast power electronics to constructed atmospheric industrial, completed with constant vocal assault. Balistreri and Deplano were inspired for this work by their family backgrounds, turf related animosities and to situations where you know you can count only on your next of keen, blood of the same blood, flesh of the same flesh. Comes in digipack and 12 page booklet with full text. Artwork by John Balistreri. Co-produced with Old Europa Cafe. Planned release: Early Autumn.